Regardless of the type of synthetic turf you have in your lawn, whether it’s short nylon or long polypropylene, the turf needs to be cared for in order for it to last as long as you would like. Just like you would have to mow or water a natural grass lawn, synthetic turf lawns also need regular maintenance to keep it looking its best. At Kern Turf Supply, we provide high-quality landscaping materials and irrigation products for Bakersfield and the surrounding Southern California areas. We offer synthetic grass and artificial turf from both EasyTurf and Smart Turf, brands that you can trust to give you a durable, beautiful lawn. But even the best products still need to be taken care of. Here are some quick tips on how you can ensure your lawn is looking lush and green for years to come. The good news is that you don’t have to lug out the lawn mower anymore or spend money on gas. However, you do need a few tools on hand to help you maintain the life of the turf. You will need a hose, a leaf blower or a rake. Leaf Blower or Rake: First, use either a leaf blower or a rake to remove any larger pieces of debris, such as leaves or small sticks that have fallen. When using a rake, choose one that is flexible or a broom that has stiff bristles. Raking the turf will ensure that the stems remain tall and can prevent them from getting matted down over time. This should be done at least once a week, or more frequently if the season calls for it. Hose: Bakersfield doesn’t get a lot of rain throughout the year, so it’s important to give the turf a good rinse. Rinsing the lawn around once a week will remove any built-up dust and debris that accumulates. Don’t worry about watering the turf, but use just enough water to wet the surface of the stems. Doing this will help remove pollutants like dust, pollen, smoke, and small debris. Accidents happen, and maybe more so if you have pets or frequent parties, but it’s important to try to clean up spills as quickly as possible to prevent staining, but we’ll go over that too. Here are a few examples of common chores and solutions. Just like a regular lawn, first pick up the waste as you normally would. When as much as possible of the waste is removed, use your hose to spray down the area. This should be done ideally soon after your pet as relieved themselves, for both solid and liquid waste. To prevent odors, it’s also beneficial to keep a bottle of turf deodorizer nearby for a quick treatment. Some homeowners also create a separate area for their pets to go, so there is less maintenance of the turf. When having the synthetic turf installed initially, let the installers know that you have pets. They may recommend using an additional layer of protection between the base and the turf, which allows for increased air circulation and will help prevent odors from developing. Kern Turf Supply wants everyone to be able to actually enjoy their synthetic turf lawns, so prevention is key. But when a piece of gum lands on the grass, a glass of wine is spilled, or some ketchup lands on the turf, it’s OK, there is a simple solution to these spills. Keep in mind that many turf lawns are stain resistant, so it’s not like the white carpet in your home, but still shouldn’t be ignored. Many spills will simply rinse off with water, but if any residue remains, simply use a mild soap with warm water, or a mix of vinegar and water. Using vinegar will also help prevent bacteria from growing. For gum, try first to get as much off the surface as possible. If the sticky substance still remains, try using a piece of ice to freeze the gum and then gently scrape it off. Above all, avoid using harsh chemicals or solvents to remove stains or anything sticky. With all of the sun and hot temperatures in Bakersfield, many homeowners worry about the synthetic turf browning. Direct sunlight won’t actually burn the turf, but it is possible for reflections off of windows or doors to damage the grass. Standard double-pane windows don’t often cause damage, but if you have energy-efficient windows, you will need to take extra precaution. Energy-efficient windows are made from low emissivity, or low-E, glass. These windows have a metallic oxide on the surface which helps reflect heat in the summer and keep heat in the home during winter. This is beneficial for the home’s temperature, but the reflections can cause damage to your lawn. To prevent reflections from browning the turf, it’s best to install awnings, shutters, or screens on the windows or doors. If reflections are coming from a neighbor, you may have to plant tall bushes or trees to block the light. 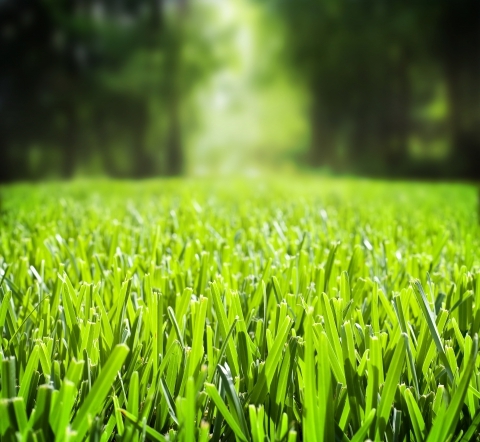 Many synthetic lawns have a shock-absorbing layer that helps create a realistic feel when you’re walking on it. After three to five years, however, this layer will begin to wear down, especially if you use the lawn regularly. This is a simple fix of peeling back the layer of grass and adding a new layer. 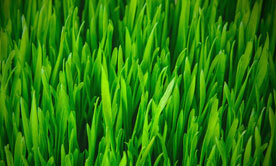 Keep in mind that higher quality turf may not need this additional layer for the lawn to feel good when you walk on it. Unfortunately, weeds can still grow even after synthetic turf or artificial grass has been installed. When weeds begin to grow, they can cause the turf to feel lumpy or even displace the mat. You can also have a weed-killing layer installed under the turf which will help prevent weeds from growing, but these need to be replaced every three to five years. However, replacing a weed-killing layer does require the turf being removed. As a precaution, many homeowners use an herbicide to keep the weeds from growing. This should be done fairly regularly and you should always be sure to avoid using harsh chemicals that can damage the lawn. The team at Kern Turf Supply will be happy to offer some suggestions for safe and effective weed killers. With regularly rinsing and cleaning up after your pet in a timely manner, there is a smaller chance of fungi or mold growth, but it is still a risk, even in the dry climate of Bakersfield. If there is enough moisture, like pet urine, and it isn’t cleaned up, spores could develop. In the case that mold or fungi does grow, use hydrogen peroxide to kill any existing mold and any remaining invisible spores. It will also help remove any musty smells. If you have any questions about how to care for or maintain your synthetic turf or artificial grass, our landscape experts can help. We are familiar with various types and brands of turf and can offer suggestions for available options during the shopping and installation process, and we can help guide you when caring for your lawn. Not Sure if Synthetic Turf is Right For You? Minimal water: You don’t need to water your lawn, just rinse it, so turf requires less water. This is a significant benefit in Bakersfield’s dry climate. Minimal Maintenance: Other than a regular rinse and raking of the stems, turf lawns are easy to take care of, letting you actually enjoy the lawn. Environmentally Friendly: There’s no need for gas or electric lawn mowers and there are even recycled turf options, which are repurposed for homes. They also don’t need fertilizers that could harm the earth. No Bare Spots: Natural grass can have problems with bare or patchy spots. Turf lawns have an even appearance. Color: It doesn’t take long for natural grass to turn brown in the summer. Synthetic turf will remain green and lush throughout the year. Above all, we want you to enjoy your lawn! 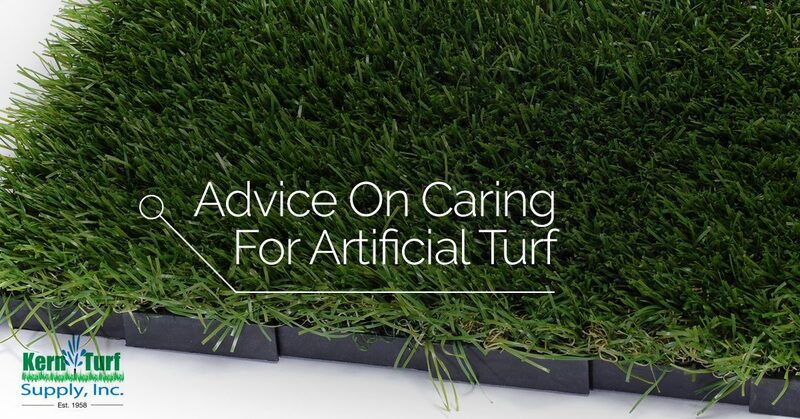 Synthetic turf is an investment that should be well taken care of. When it is, turf can last around 20 years, or even longer with the right care.